If you are looking for something elegant to add some extra color to your party, hang a few Tulle Balls from the ceiling or rafters. 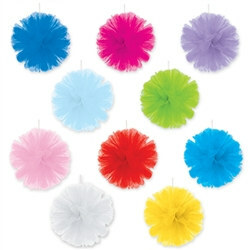 These Tulle Balls come two (2) per package with each measuring 8 inches. A white ribbon is attached to each one for easy hanging. Available in blue, cerise, lavender, light blue, lime green, pink, red, turquoise, white and yellow. Make sure to check out our wide variety of party items, decorations and tableware.